ODNR designated the state’s 152nd wildlife area on Friday, Jan. 11. 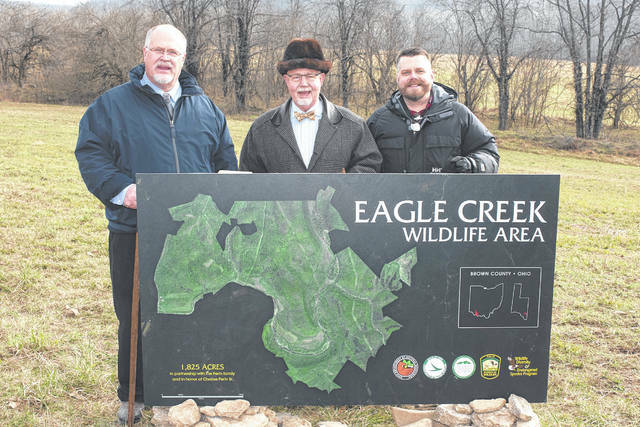 The newly purchased parcel will be known as the Eagle Creek Wildlife Area, and the initial purchase of approximately 1,825 acres will be followed by a smaller purchase of 474 acres later this year, making the property approximately 2,300 acres. Pictured are Robert Perin, Charles Perin Jr. and Charles H. Perin III. The Ohio Department of Natural Resources (ODNR) recently designated the 152nd wildlife area in the state for the purpose of wildlife conservation, propagation and habitat management. In December 2018, the ODNR Division of Wildlife closed on property in southwest Brown County. The newly purchased parcel will be known as the Eagle Creek Wildlife Area. The purchase, which cost approximately $4.1 million, was funded by the Land and Water Conservation Fund, the Wildlife Diversity Fund and the Ohio Department of Transportation. The land was purchased from the Robert Perin family. The ODNR Division of Wildlife has worked for years with the Perin family to acquire the property. The initial purchase of approximately 1,825 acres will be followed by a smaller purchase of 474 acres later this year for a total of 2,299 contiguous acres. The Eagle Creek Wildlife Area will allow hunting, fishing, trapping and wildlife viewing opportunities. The property will not be open to the public until the fall of 2019. The department will be posting the boundaries, installing a parking area, developing a map, and most important, will have the area listed in the Ohio Administrative Code (OAC) as a public area prior to opening it for use. Visit the ODNR Division of Wildlife’s website at wildohio.gov to learn more Ohio’s wildlife areas. The ODNR works to ensures a balance between wise use and protection of natural resources for the benefit of all. Visit the ODNR website at ohiodnr.gov. Submitted by Stephanie Leis, ODNR Division of Wildlife.